Um, so, this is sort of an inside joke between myself and like three people and like Canada (as in, the country). But, mostly myself. This picture gave me hell. So, I don't really feel like talking about it. Especially that damn hat. >: [ I will say, though, that looking over Hitsugaya's character design, he's kinda feminine. And my brain has sorta . . . . gone with that, lol. So here's a random definition that has nothing to do with this picture! Bishounen (as defined by Wiki, so take it as you will) "in the original Japanese . . . "bishōnen" applies only to boys under 18." Go read the article! Watch out for Genji! I'll tell you what, the bishounen in Bleach? It ain't Byakuya. Photoshop, part of the bookmark series. Alright curiosity has got the best of me. Lol, cowboy hats amuse me. Not too many of 'em 'round here, though. We got plaid. If you're wondering about the Sunday thing, see my reply to FreeSpirit up there. Lol. Cowboy hats amuse me. Not too many 'round here, 'though. We got plaid. nice...He is one of my favorite characters of the show. I am curious...what does 5x to sunday mean? But, in Bleach vol 12, after Renji got all beat up by Ichigo and all the important people are comin' to stare at him, Hitsugaya shows up. In the Japanese manga, he says "Wow, Abarai really got beat!" but in the English version, which is translated by VIZ which is a Canadian company, he says, "Wow, Renji got beaten five times to Sunday!" There's an expression that DOES exist: "six ways to Sunday", which is, something happens every day except Sunday. If you Google "five times to Sunday", the only place it comes up is in a Canadian government House of Commons Debate, and they're talking about . . . hockey. So, I'm thinkin' VIZ made some political statement. In manga. >: [ So I've sort of latched on to the expression and . . . here it is, lol. ya that helped...but I could have sworn in the english version he just said "Wow, Renji sure got beat up" or something to that extent...oh well...this is, afterall, coming from a person who can barely remember what she did a few days ago, let alone what happened in an anime show over a month ago...so I could be wrong...thanks though it helped. I do know the term six days to sunday but 5 days was an unknown for me. I think I know the term because I grew up in Arizon and southern Cali for most of my life...people don't realize how much they are like Texas...I am a country girl at heart...I walk around outside barefoot just because I can, I am a fan of Country music and love horses. 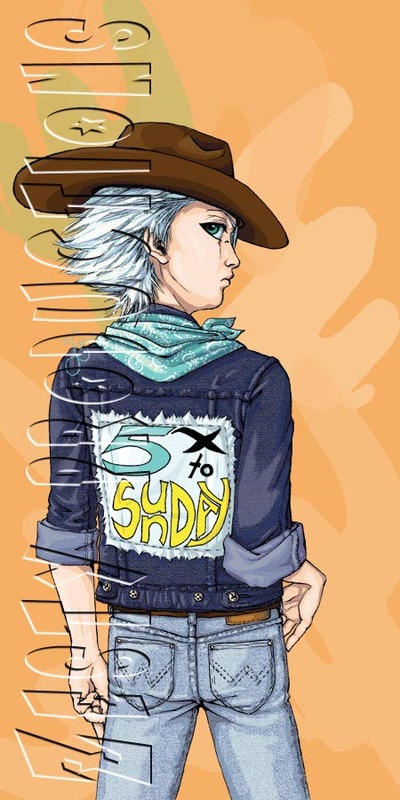 I also have a huge crush for Hitsugaya so seeing him in country garb just tickled me. XD Well I'm glad you like this picture, lol. I don't think many people do. But, it amuses me, so that's what counts. Arizona is so beautiful! Really hot, though . . . He's fun to draw, what can I say, lol?